I’m sure you have a much more organized system for wrapping your presents than I do….. This would be called the “scatter everything on the living room floor, grab a gift, then search around for what you need to wrap it with” method!! 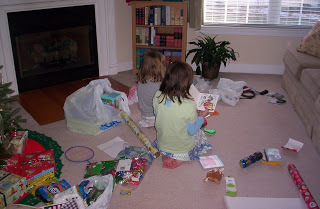 My girls were engrossed in reading the books we bought for my nephews. 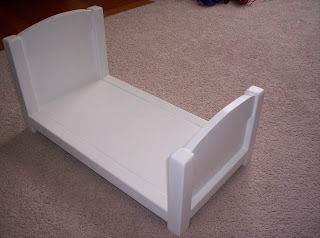 Well, our daughters’ doll beds are nearly done! The finishing touch will be a wooden letter (their initial), painted in black, and attached to the center top of the headboard. 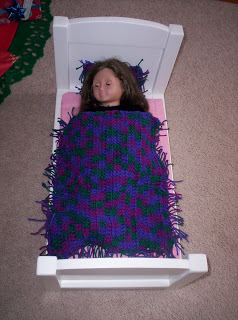 Here’s one of the dolls trying out her new bed. I took these pictures while my husband was out with our daughters yesterday, doing their annual Christmas shopping trip for my presents. The girls got lunch out of the deal as well, so I think they were pretty pleased! I know they’re going to love their doll beds tomorrow, too!! My system is about has good as yours for wrapping gifts 🙂 I do love the doll beds. Your girls will love them. Have a great day tomorrow! That is exactly what my bedroom floor looks like when I wrap presents! Your husband did a great job on the doll beds! I can't wait to read about the girls excitement for them 🙂 Merry Christmas! I read a suggestion on someone's blog last year that, if you celebrate with different sides of the family (as we do), to wrap each side's gifts in different wrapping paper. So now I have a system. 🙂 It's sheer genius, knowing "the gifts in this paper go to his side of the family; the gifts in this paper go to my side of the family."